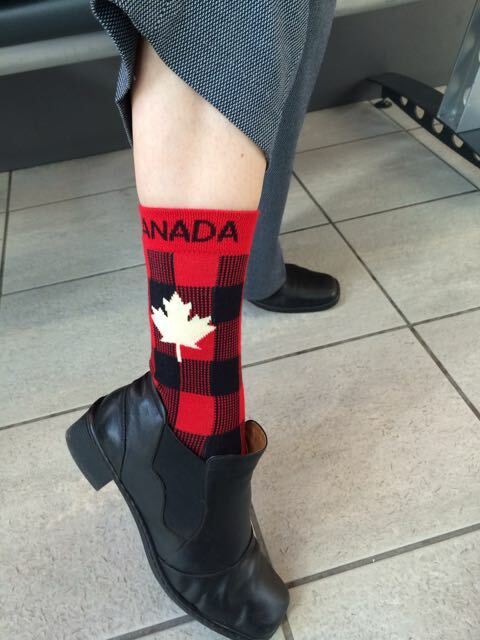 On that spectacularly sunny morning, as I opened my eyes, my sweetheart presented me with a gift of red socks with the word “Canada” across the top – how chic! And in the kitchen, I found a gorgeous bouquet of a dozen red roses, red carnations, white daisies and a white mum, plus six pink roses (“for love”). 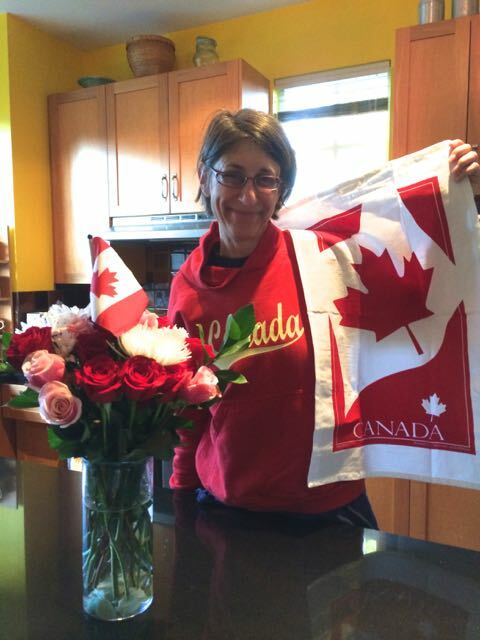 The vase was sitting on a souvenir tea towel with a huge red maple leaf and the word “Canada” across the bottom. What a welcome to my new home country! But wait, there’s more! 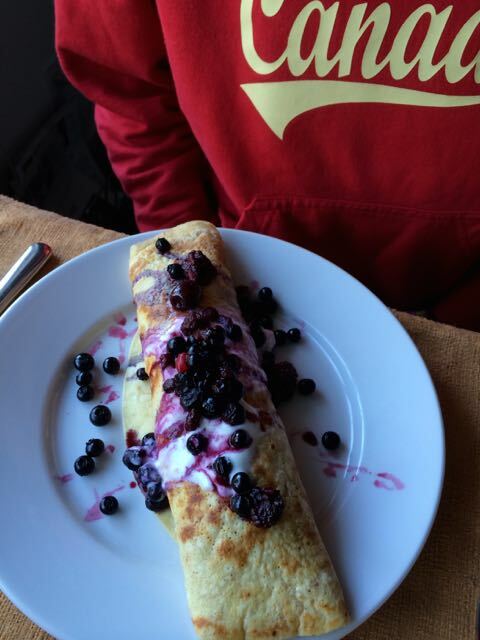 For breakfast, I was treated to my “special day” favourite, a marvelously sweet and crunchy pancake parfait roll-up (possibly a spin-off of the Pancake Roll from our beloved Pete’s Breakfast House in Ventura?) topped with granola and fruit, including home-canned Okanagan peaches. YUM. It was a special day, indeed. 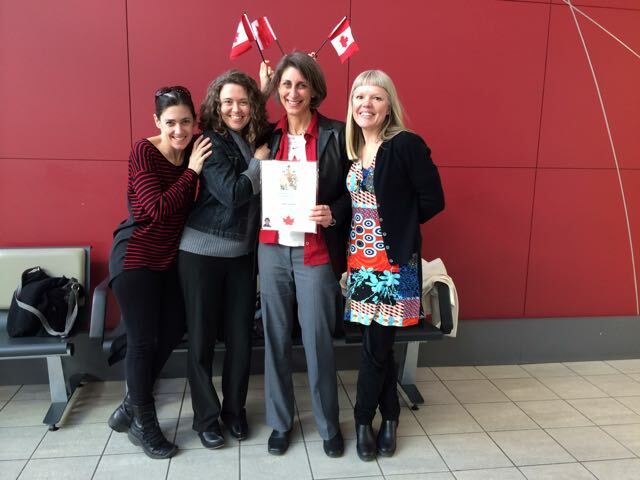 At 1:30 p.m., after a morning of “regular” work, we arrived at the Citizenship and Immigration Canada office in downtown Vancouver, where we met two dear girlfriends who’d agreed to join us to witness the ceremony. As directed, I checked in with the officials, showed them the pile of paperwork they’d asked me to bring (which they didn’t look at), and turned in my Permanent Resident card – it felt strange to give it up, but when I remembered that I’d soon have a Canadian passport in my possession, that feeling quickly slipped away. I was sent back to the Ceremony Room after signing a form saying that I wasn’t in trouble with the law, and was directed to look for Seat 33 in middle of the second row – the number, I was told, would be on the left arm of the chair. I found the seat easily, even though on that particular chair, someone had removed the plaque with the number – was there any significance in that, I wondered? Maybe just a reminder that everything in Canada isn’t perfect? (I’m open to other interpretations!) There were four rows of us “newcomers” and a couple rows in the back for the bystanders, including my posse. On either side of me sat two families, one from Asia and the other from Chile. At 1:45, the clerk brought the group to order and explained how we’d be proceeding – the citizenship judge would come in, we’d stand, we’d sit, she’d give a little talk and lead us in saying the Oath of Citizenship, and hand out our Certificates of Citizenship. And sure enough, that’s what happened. Judge Ann Dillon spoke eloquently about Canada being a nation of immigrants, a concept I’m quite familiar with from my upbringing in the U.S., but it’s something different now to be an immigrant! She had a lot to say about February being Black History Month and the contributions that black Canadians have made since the land was settled by Europeans, including the fabulous Oscar Peterson. (She only mentioned men, by the way… hmmmm.) Though I didn’t notice any black people in the room, Judge Dillon mentioned that the 79 of us taking the Oath that day came from 14 countries around the world, so everyone was “represented” (sort of). The Judge spoke about how the First Nations (Aboriginals) generously welcomed the first Europeans to arrive, and briefly mentioned the difficult and ongoing reconciliation process that the country is now going through (which is to say, the Europeans weren’t quite so kind in return). I feel quite fortunate to have had a chance under a variety of circumstances to meet several leaders of First Nation communities, including the leaders of Reconciliation Canada. I didn’t know much about residential schools before I moved to Vancouver, yet knowing their history is crucial to understanding the social fabric that is Canada. I was most moved by Judge Dillon’s words about the importance of becoming involved in our communities, paying attention to what’s happening around us and becoming active citizens, because “each person can make a difference.” As an example, she spoke about Terry Fox, one of many Canadian heroes I never heard of before living here, but every single Canadian person knows. Terry was a “regular” person who made a huge difference. In 1980, with one leg having been amputated, he set out on a cross-Canada run to raise money and awareness for cancer research. He couldn’t finish the run because of his illness, and died the next year, but his efforts led to the annual Terry Fox Run, which involves millions of participants around the world, and is the world’s largest one-day fundraiser for cancer research. 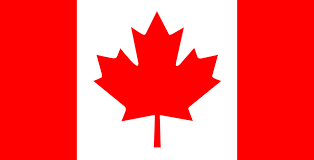 I swear (or affirm) that I will be faithful and bear true allegiance to Her Majesty Queen Elizabeth II, Queen of Canada, Her Heirs and Successors, and that I will faithfully observe the laws of Canada and fulfil my duties as a Canadian citizen. And then we said it in French. Ooh la la. Those in the back rows who were already Canadians were invited, if they chose, to re-affirm their oath of citizenship – for those who were born here, this was likely their first time actually saying the words, so it was meaningful for them too (so I heard from my friends, who chimed in.) As an American, I’ll admit it was a little strange to say I’ll bear allegiance to the Queen – after all, didn’t we fight a revolution against the monarchy? – but as the Judge explained it, since HRH is the Head of State, it’s really just pledging allegiance to Canada, the country. And hey, I’m cool with it all. 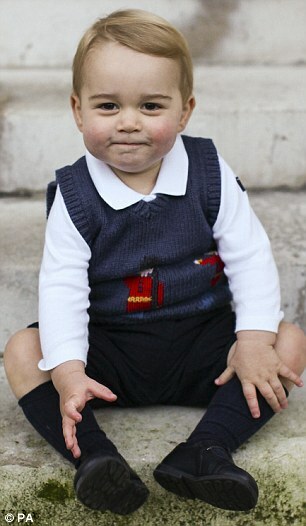 That little Prince George is okay by me. At the end of the ceremony, we sang “Oh Canada,” and that’s when it hit me and I choked up a little bit– hey, this is now MY national anthem. The ceremony was meaningful, but it wouldn’t have been nearly as special for me if my sweet love and friends hadn’t been there. They each had a small Canadian flag that they waved over my head as we exited the building and headed over to Starbucks for Candianos (okay, they were Americanos but some places do call them that!) and Nanaimo Bars, one of my favourite Canadian treats. Several people have asked me why I chose to become a citizen – after all, I could have kept living here indefinitely as a Permanent Resident, and many people do. My answer is simple – to vote. I believe in democracy, and as long as I’m living in this country, I want to make sure my voice can be heard – because, to be honest, I’d like to see some changes, particularly at the federal level with its current anti-terrorism (or “Secret Police”) bill that four former prime ministers say needs stronger oversight, and which is a dangerous piece of legislation in terms of its potential impacts on the rule of law, on constitutionally and internationally protected rights, and on the health of Canada’s democracy. And so, I’ve registered to vote. 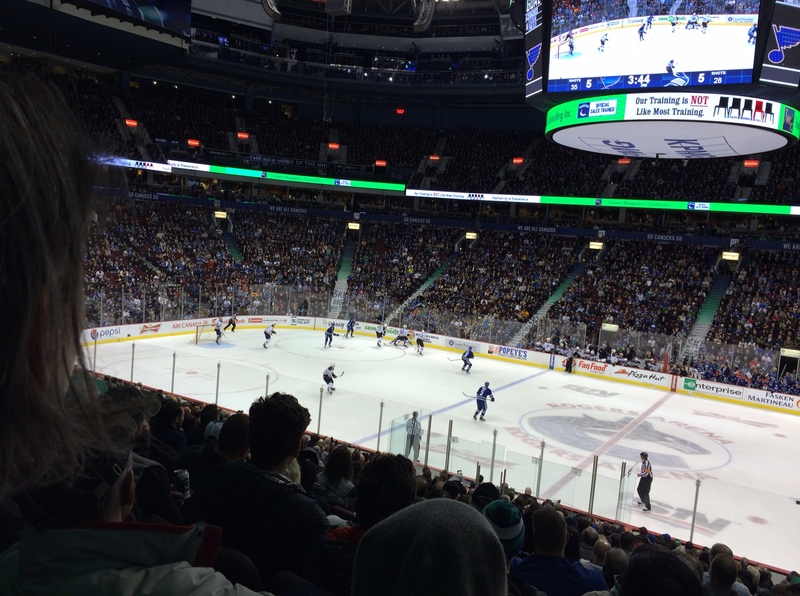 To cap off the week, we were treated to Club Seats at the Canucks game and watched our team recover from a blown lead to win the game in a shootout. 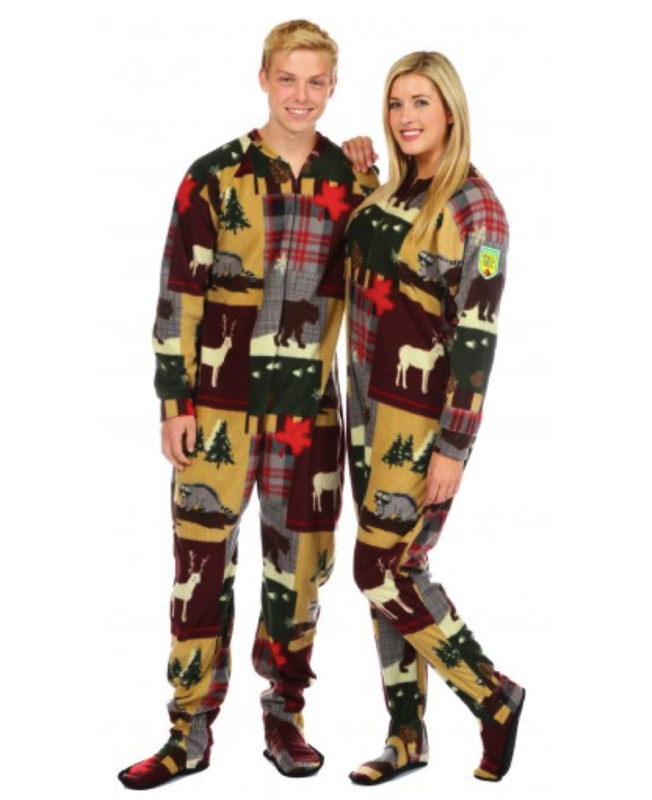 Now, how Canadian is that, eh?!? Thank goodness! I still love you too! Congratulations! Very happy for you, thank you for sharing with us! Very exciting! Congratulations! A very special day indeed.